This release does not brings many new features. Basically there are only two main new features: “Print Preview Pane” and “Printer Setup Wizard”. Rest changes are not visible, however they are great and important. priPrinter is already a print preview application, why we need an additional preview pane then? Well, it’s a good question. My reason is to provide an ability to view and select pages which will be printed right now. Let’s say you want to print only specific pages. In any application you should somehow remember numbers of these pages and type them in Print dialog. Something like: 1-10, 22,23,30. It is hard to be sure that you typed these numbers right, and you should check it few times. 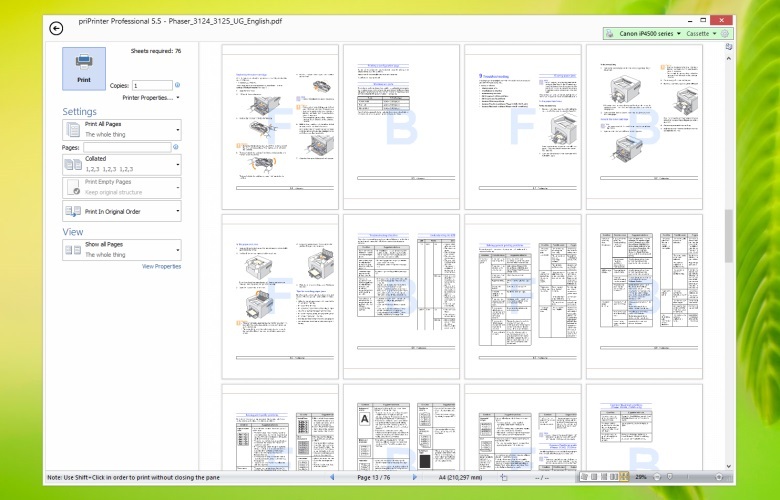 In priPrinter 5.5 when you change the range of pages, preview windows is updated and you see pages selected for printing. It’s simple as that. In case if made a mistake, or decided that you don’t need several pages your can remove them by editing text of page ranges. However there is another way, you may click on any page in order to include/exclude it from printing. Let’s say you don’t need 6th page – just click on it in preview window. Text will be updated to 1-5,7-10, 22,23,30. Very easy and very convenient.